Press Trust of India (PTI) has reported that Nalini Sriharan who is presently undergoing life imprisonment in the Rajiv Gandhi assassination case has again moved the Madras High Court seeking a direction to Tamil Nadu government to consider her representation for remission of her life term as she has already undergone imprisonment for more than 24 years. She was first awarded death sentence, which was confirmed by the Supreme Court and subsequently Tamil Nadu government under Article 161 of the Constitution commuted her sentence to life on April 24 2000. Stating that about 2,200 life convicts who had served 10 years of sentence had been released by the State of Tamil Nadu, she said it had not considered her release on the ground that her case falls under a different section of Code of criminal procedure. She submitted Tamil Nadu government has framed a scheme of remission of life term awarded to convicts who had completed 20 years of actual imprisonment. A Government Order was also passed on Novedmber 10, 1994 even under which she was not considered for release, she said. 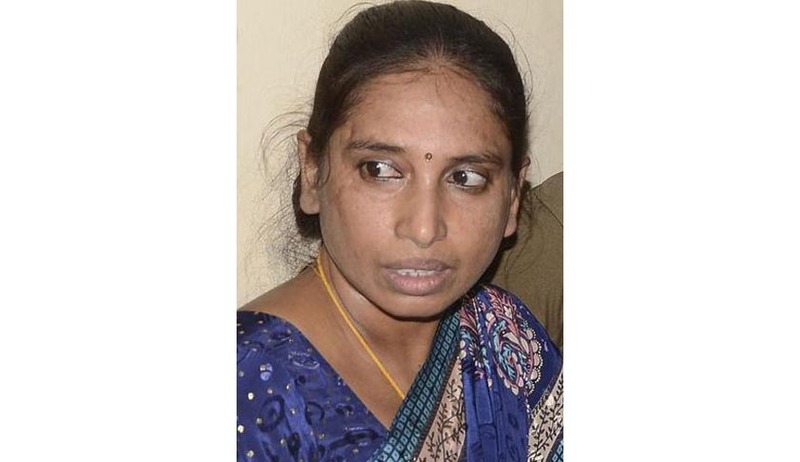 Claiming that she is eligible to be considered for remission of sentence under this scheme, Nalini submitted that she had made a representation on October 22, 2014 to the state government to consider her plea for remission but government was yet to decide on the representation. She sought a direction from the court to decide on her representation within a reasonable time. Nalini was sentenced to death by the trial court in the case on January 28, 1998. Her sentence was commuted to life term by the Tamil Nadu Governor on April 24, 2000. The seven convicts in the Rajiv Gandhi assassination case are Robert Pious, V Sriharan, Santhan, Jaya Kumar, Arivu, Nalini and Ravichandran. The Centre had last year contended that the TN government cannot release the convicts without its approval and had opposed the state government's decision to release them. After the apex court had commuted the death sentence of Murugan, Santhan and Perarivalan on the ground that the 11-year delay in deciding their mercy petition by the Central government had a dehumanizing effect on them, the state government had on February 19 last year proposed to remit the sentences of all seven lifers, including the three, and release them. This decision was challenged by the Centre before the Supreme Court. The Supreme Court had on February 20 stayed the decision to release Murugan, Santhan and Arivu--whose sentence was commuted to life by it on February 18, saying there had been procedural lapses on the part of the state government on the decision to release them. It had later on also stayed the release of convicts Nalini, Robert Pious, Jayakumar and Ravichandran in the case. Santhan, Murugan and Arivu are currently lodged in the Central Prison, Vellore, and they are serving out their sentence since 1991. The other four are also servng life term for their role in Rajiv Gandhi's assassination on May 21, 1991 in Sriperumbudur. It may be recollected that a bench of the Supreme Court comprising of Chief Justice H.L. Dattu, Justice Madan B. Lokur and Justice A.K. Sikri had earlier dismissed the plea of S. Nalini challenging the legal requirement which mandated the state government to consult the Centre before premature release of a convict if the case was investigated by the CBI. In Swamy Shraddananda (2) v. State of Karnataka (2008), a three Judge Bench of the Supreme Court held that there is a good and strong basis for the Court to substitute a death sentence by life imprisonment or by a term in excess of fourteen years and further to direct that the convict must not be released from the prison for the rest of his life or for the actual term as specified in the order, as the case may be. In Sahib Hussain @ Sahib Jan v. State of Rajasthan, another two Judge Bench reiterated the position held in Swamy Shraddananda (Supra) by holding that the observations in Sangeet (Supra) are not warranted. In Gurvail Singh @ Gala v. State of Punjab, another two Judge Bench also termed the remarks in Sangeet (Supra) were ‘unwarranted’ and opined that if the two Judge Bench was of the opinion that earlier judgments, even of a larger Bench were not justified, the Bench ought to have referred the matter to the larger Bench. Finally in Union of India v. Sriharan@ Murugan another three Judge Bench referred it to the Constitution Bench. The Constitution Bench headed by Chief Justice Dattu by 3;2 majority upheld the ratio in Shraddananda Case. While CJI Dattu, Justice Ibrahim Kalifulla and Justice PC Ghosh upheld the dictum in Shraddananda, Justices AM Sapre and U.U Lalit had dissented. As to the question whether the “Appropriate Government” is permitted to exercise the power of remission under Sections 432/433 of the Code after the parallel power has been exercised by the President under Article 72 or the Governor under Article 161 or by this Court in its Constitutional power under Article 32 as in this case? The majority had opined that the exercise of power under Sections 432 and 433 of Code of Criminal Procedure will be available to the Appropriate Government even if such consideration was made earlier and exercised under Article 72 by the President or under Article 161 by the Governor. As far as the application of Article 32 of the Constitution by this Court is concerned, it is held that the powers under Sections 432 and 433 are to be exercised by the Appropriate Government statutorily and it is not for this Court to exercise the said power and it is always left to be decided by the Appropriate Government. The Constitution bench in its majority verdict had also held that “having regard to the principles culled out in paragraph 160 (a) to (n), it is imperative that it is always safe and appropriate to hold that in those situations covered by sub-clauses (a) to (c) of Section 435(1) falling within the jurisdiction of the Central Government it will assume primacy and consequently the process of ‘‘Consultation’’ in reality be held as the requirement of ‘‘Concurrence’’.